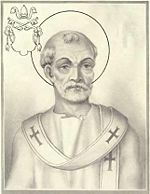 Pope Saint Eusebius (Greek Εὐσέβιος: "Pious") was pope for four months in either 309 or 310. His pontificate was characterized by violent disturbances between rival factions within the Roman church over the question of the terms under which Christians who had denied their faith during the persecutions of Diocletian could be readmitted to communion. As a result of his inability to bring order, he was banished from Rome, leaving the papal chair vacant. Eusebius' predecessor, Marcellus I, as the leader of the Roman Christians who were seen to be disrupting the peace of the city, had been deposed and exiled when he proved unable to control the situation. After Eusebius fared no better in reconciling the rival factions, he too was banished by the emperor Maxentius, who had been the ruler of Rome since 306, and had at first shown himself friendly to the Christians. Eusebius died in exile in Sicily and was buried in the cemetery of Callixtus. By tradition he is called a martyr. The Liber Pontificalis states that Eusebius was a Greek who had previously been a physician. Two versions of this source give his reign as lasting either two or six years. However the Liberian Catalogue of the popes makes its duration only four months, from April 18 to August 17, the year being either 309 or 310. This source is generally considered more authoritative. Some details of his career come from a large epitaph placed on his tomb, which was ordered under the pontificate of Damasus I less than half a century later. Even before the tomb's rediscovery, the epitaph had been known through ancient transcripts. A few fragments of the original, as well as with a sixth century marble copy made to replace the original after its destruction, were found by archaeologist Giovanni Battista de Rossi in the papal chapel in the catacombs of Callixtus. The epitaph make it clear that the grave internal dissent, caused by the re-admittance of apostates who had renounced the faith under the persecution of Diocletian, continued under Eusebius. The issue of how to treat Christians who had committed mortal sins had plagued the Roman church at least since the time of the first antipope and later saint, Hippolytus. It had reached empire-wide proportions during the time of Pope Cornelius, whose papacy was opposed by the respected Roman presbyter Novatian, who became the second antipope and later a martyr for his faith. The Novatianists held that apostates could not receive absolution from mere bishops, and that only God could forgive "sins unto death" like apostasy, murder, and adultery. The Catholic Church took its name (catholic meaning "universal") from its position that the church must accommodate sinners as well as saints, and that the bishops, as Christ's representatives, were authorized to absolve even the most grievous sins. Marcellus I had become pope during a period of great turmoil which left the Roman church badly shaken, with rumors that his own predecessor had committed apostasy during the persecution. After Maxentius ended the persecutions, apostate Christians began to return the the church in large numbers. No doubt the Novatianists were able to attract some Catholics who were disgusted by the prospect of these turncoats returning too easily to the fold. Marcellus thus required strict public penance from the apostates, whom the Catholics referred to as merely lapsi (lapsed). The prescribed penance, however, provoked a severe reaction from many of the lapsi, who believed that they had never truly turned apostate but had only told a white lie to preserve their lives. Conflicts soon arose among the Catholics, some of which ended in bloodshed. Riots broke out throughout the city, and Marcellus' inability to control the situation resulted in his banishment. If Maxentius expected the new Roman bishop to pursue a less strict policy toward the lapsi, he was mistaken. Eusebius, of course, maintained the attitude of the Roman church, adopted after the Decian persecutions (250-51), that the apostates should eventually be absolved of their sins and readmitted to full ecclesiastical communion. However, he insisted that they be readmitted only after doing proper penance. This policy was strongly opposed by a faction of Christians in Rome under the leadership of a man named Heraclius. Some have held that Heraclius may have actually been a Novatianist who opposed the re-admittance of the lapsed on any terms. However, it is by far more probable that he was the chief of the party made up of the apostates and their supporters who demanded the restoration of lapsi without a long or harsh period of penance. In his tribute to Eusebius, Damasus I characterizes the conflict in very strong terms, using such terms as sedition, discord, and even warfare. It is likely that Heraclius and his supporters sought to compel by force their admittance to divine worship, which was resented by the faithful gathered in Rome under Eusebius as their bishop. The disappointed Maxentius ordered both Eusebius and Heraclius deported to Sicily, where Eusebius soon died. The Roman episcopacy remained vacant until Miltiades ascended the papal throne, July 2, 311. One of his first acts was to cause the body of Eusebius to be brought brought back to Rome and placed in the Catacomb of Callixtus. Eusebius' defense of ecclesiastical discipline and the banishment which he suffered as a result caused him to be called a martyr by Pope Damasus I. During the reign of his successor, the Edict of Milan declared the neutrality of the Roman state in matters of religion, bringing to an end the persecution of pagan Rome against the Christian faith. His feast is marked on August 17, in the Roman Martyrology. He should not be confused with several other saints called Eusebius. This page was last modified on 9 October 2013, at 22:04.